Prof. Jason W. Ellis recently used the City Tech Science Fiction Collection to find and share readings relevant to the NEH-funded “A Cultural History of Digital Technology: Postulating a Humanities Approach to STEM” Project directed by Prof. Anne Leonhardt and Co-Directored by Profs. Sandra Cheng, Satyanand Singh, and Peter Spellane. “A Cultural History of Digital Technology” is a National Endowment for the Humanities’ Humanities Initiatives at Hispanic Serving Institutions-funded eighteen-month interdisciplinary faculty development project. It’s faculty participants—NEH Faculty Fellows—take part in reading and activity workshops, engage with invited speakers, and ultimately, plan the curriculum for a new, interdisciplinary course for first-year students in the School of Technology and Design that bridges cultural and historical significance to their science and technology-focused educational career path. The third seminar of “A Cultural History of Digital Technology” is titled “Fractals: Patterning, Fabrication and the Materiality of Thinking,” and it was for this seminar that Prof. Ellis made his discoveries in the collection. This module explores the interdisciplinary perspective that led to Benoit Mandelbrot’s insights into fractal forms in nature, mathematics, signals processing, and computers, and it realizes the materiality of fractal roughness through the materiality of 3D printing and rapid prototyping. The other NEH Faculty Fellows working on this module include Profs. Michell Cardona, Boyan Kostadinov, Anne Leonhardt, Satyanand Singh, and Peter Spellane. To support the discussions that accompanied a workshop on generating fractals in Mathematica, Matlab, and Mandelbulb3D software and realizing those computer-generated forms as 3D printed models, Prof. Ellis shared the earliest known stories that express some of the important ideas behind what we now call 3D printing: Robert A. Heinlein’s “Waldo” in the Aug. 1942 issue of Astounding Science Fiction (cover pictured above), which imagines remotely controlled armatures on macro and micro scles (Heinlein’s “waldo” became the accepted term for this kind of technology), and Eric Frank Russell’s “Hobbyist” in the Sept. 1947 issue of Astounding Science Fiction (cover pictured to the left), which imagines a godlike manufacturer of lifeforms who creates with what we would call today a 3D printer. 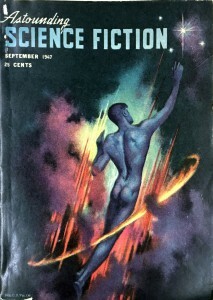 Of the two stories, “Hobbyist” is far more difficult to find, and the City Tech Science Fiction Collection’s holdings of Astounding Science Fiction made is possible for this important SF story to inform the discussions of City Tech faculty designing the new course. Having access to these stories in their original published form within City Tech’s Library Archives made it possible to easily share these readings with team members, and it informed the cultural side of the on-going discussions in the project. This is a small, but early win for the collection’s impact on faculty research that informs pedagogy by supplying needed cultural and historical context in a timely manner. 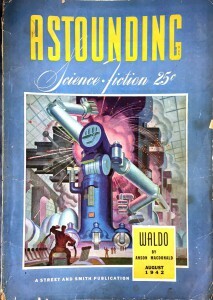 This entry was posted in science-fiction-collection and tagged hobbyist, neh, use, waldo on May 17, 2016 by Jason W. Ellis.